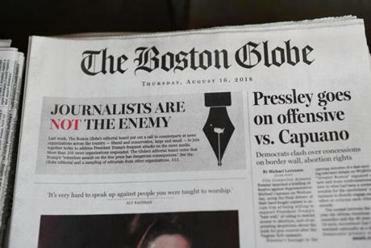 On Thursday morning, the editorial pages of more than 350 newspapers around the country were filled with arguments in support of a free and independent press in response to a call from The Boston Globe’s editorial board to confront President Trump’s recent attacks on the media. The nationwide push generated widespread reaction, from the president himself to professional sports figures. Former secretary of state John Kerry cited his experience traveling to areas of the world where media is restricted in offering his support. A #FreePress reflects our own words and actions for the world to see. So if you don?t like the story being written, maybe you should change the story being told. The move comes amid a Boston Globe-led push where more than 350 news organization published editorials promoting the freedom of the press. Celtics legend Bill Russell, who has been a frequent critic of President Trump, said he makes an effort to buy the local paper wherever he happens to be. The Globe also saw pushback from the effort, in particular from Trump, who ridiculed the terms of The New York Times’s sale of the Globe to John Henry by erroneously saying the Globe was sold for $1. One newspaper that did not participate in the Globe’s call for an editorial response was the Capital Gazette in Maryland, the site of a recent mass shooting that left five employees of the small newsroom dead. The paper explained its decision in an editorial published Thursday. “We’re just not coordinating with other news organizations because the president’s opinion, frankly, is just not that important to us,” the editorial board said while noting it had expressed concerns about Trump’s rhetoric in the wake of the deadly shooting.